The 2016 sales totals are in! We hit over six figures! 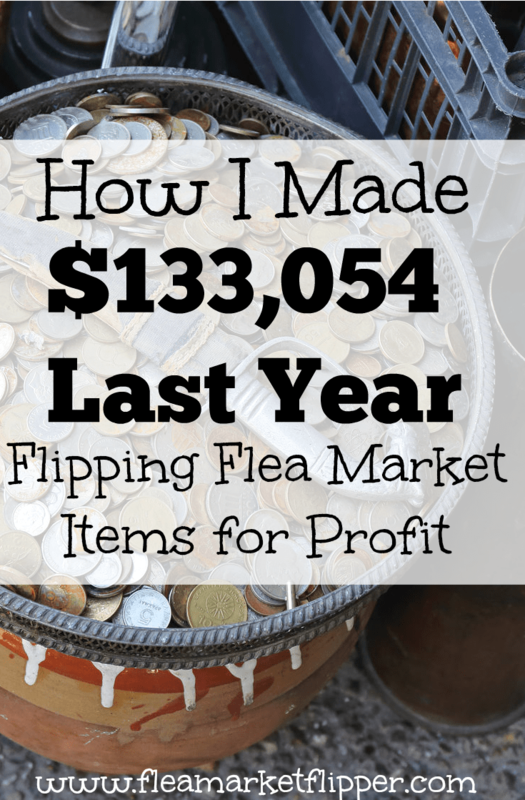 We made $133,054 in sales last year flipping flea market, thrift store and yard sale items. Holy cow! We more than tripled our 2015 income totals ($42K). In May of 2016 I decided to quit my ‘regular' job, and focus more on flipping items full time. It was a decision that came about because I was losing my benefits with my company and I no longer felt the need to put energy there. It was quite a crazy time because my wife had just had our third baby and stepped away from her personal training career to be home with the kids. We didn't have a lot of money in savings like we had hoped to before the baby was born, but that just made us depend on God all the more. You can read more about that story HERE. 2016 was a busy, crazy, trying, fun, work filled, blessed, sleep-deprived year. We have embraced being a family of 5 and have brought our kids into this business with us. They love it actually. 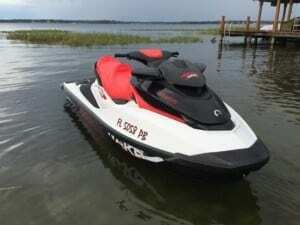 It's a constant influx of toys & gadgets to play with, and hover rounds or jet skis to ride on. Just when they get board playing an items, it gets sold, and a new one come in! Another part they love even more is the flexible schedule that we have. They are still to young to really communicate this to us, but we know they appreciate it. They love that both Melissa and I are able to take them to go see Santa on a weekday (when lines are super short! ), or go to the trampoline park during toddler play, or take a family walk most days of the week. Spending time together as a family is very important to us, so we make sure to do things together as frequently as possible. Just today Melissa was going to tuck the kids in for a nap, and they asked for ‘daddy'. I was working in the garage this afternoon so was able to tuck them in. To me these little moments make me so thankful for the ability to do my own schedule and work from home. That may sound a little cheesy coming from a guy, but I have never been one to be a work-a-holic. I like to have fun, I love to spend time with my family and friends, and while ‘flea market flipping' is what I do, I enjoy it so I never dread the work that goes into it. This item was an interesting sale to say the least. I sold it in less than a month, and the buyer was several states away. He sent someone to pick it up and there were no issues, we were happy to sell it and he was happy to get it for his large property. The interesting part came when Paypal saw the large transaction in my account and decided they had the right to hold it. I completely understood if they were holding onto it for a couple days to verify funds, like a normal bank, but this was not their intention. After getting on the phone with them to figure out the hold, they said they had the right to hold it for 90 days, to verify the buyer would not cancel the transaction on his credit card! WHAT?! Holy cow I was upset when I first heard this. I ended up calling the buyer and conference calling PayPal to talk with them about releasing my funds, He told them he was happy with the item and was not going to be canceling the transaction. PayPal didn't care. They said they were still holding it for 90 days, and then would review it and they could hold it for an additional 90 days if they chose to!! WHAT?! This was insanity. How was it legal for them to hold my money? Well, I found out later it wasn't. I am going to write a whole blog post about my experience, but haven't yet because I didn't want to write it out of anger and complete frustration, but from a place of advice and help what to do in this situation. (UPDATE- Here is the post on how I got PayPal to release the funds.) I ended up writing a letter to my state congressman (thanks to the advice from Screw-Paypal.com. ), and the funds were released immediately after they received it. They knew they were doing something wrong or they wouldn't have released the funds so easily. During this time they also said I owed them $1,000 from an account that was linked to my name 12 years ago. I did not recognize the email address they said was linked, and was also wondering why they decided to come after that money now – after all this time. I have had an active Paypal account since it came about in 1999. They had plenty of time to contact me for that money. With my letter I was able to get that money back as well. Enough about Paypal, I will write another post about that because I still have to use it daily! I just take my money out the moment it gets in there now. I had a few other favorite flips from the year. One would be a pair of jet skis that I flipped. This was probably my favorite flip of the year because we were able to play with them a couple weeks before we sold them. I really loved them and wanted to keep them, but we needed to sell them pretty quickly so that is what we did. Oh, #responsibilites. I bought the pair for $5,000 and sold them both for $17,000! Another great flip for the year was a HoverRound chair that I bought. I bought it from a vendor at the flea market for $88 and sold it on eBay for $949. . I also took one of my daughters for a ride in it a couple times before it sold. 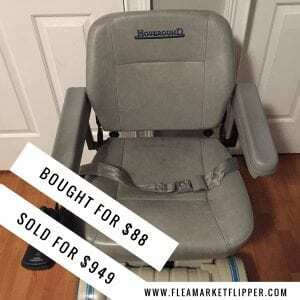 Melissa likes to resell baby items because that is the phase of life we are in right now, and we are familiar with brands that are more expensive. 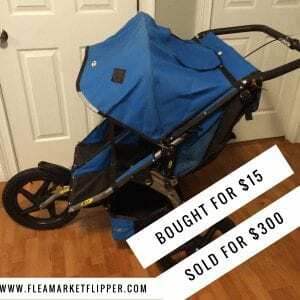 We bought this BOB stroller from the flea market for $15, and sold it on eBay for $300. Sometimes we sell strollers on Facebook, but they usually get a bit more money on eBay. Facebook groups can be really good to utilize, but some of them want stuff for pennies so not all of them are great. We are in about 15 yard sale groups on Facebook at the moment. I had a few flips this year that were freebies. This barbie corvette was one of them. There are several ways to get free items to sell (not stealing!!). I actually come across them all.the.time! You can check out more info on some more ways HERE. Those were just a couple for the year, as you can imagine it has been a busy year! Some items we flip fast, and some we sit on for months, or even longer. Usually it doesn't bother me to sit on items for a while, but Melissa prefers the quick flip and would rather sell it a little cheaper. I tend to hold out for the price that I want. Once I have sat on an item too long, I will then lower the price. So why do I want to post an income report? Over the past couple years we have broken into the blogging world and have noticed it is a fairly common practice among bloggers. It is actually been an encouragement to my wife and I to see other entrepreneurs post their income reports in their respective businesses. It helps us work harder and push through any road blocks, so I am hoping to offer the encouragement to you. I didn't start in this industry yesterday, and success hasn't happened overnight. Over time I have been able to grow this business into something my family can live off of, and on my own hours, doing something that I truly enjoy doing. If this is something you are passionate about doing, know that you can! Do you currently have a side hustle you are working on? If so, please share what it is below in the comments! If not, are you wanting to start one this year? looks like you take advantage of the people selling the items unknowing their value… you should give them a percentage unanimously of the earnings you made out of kindness…. They have the exact same opportunity that I do to sell their item on eBay. They choose not to. They prefer for me to buy from them again and again and not mess with listing and shipping. That is their decision – not mine. I actually have some pretty great relationships with a lot of my vendors. One of the guys I buy from drives around a few times a week and gets stuff from the trash. I know he is paying nothing for the items but that doesn’t change the fact that I pay him $20-$100 for something. I am curious about how folks who make flipping their main family income manage health insurance? Hi Patricia! We use Medi-share. It’s not technically insurance, but it’s very similar. Everyone pays money in and it’s shared among the participants. It is exciting! I had kind of started through selling (clearing out) our household stuff late last month after reading your articles. It’s been nicely rolling over and I’ve picked up a few extra items on the way. I did learn my lesson though – in driving a couple of hours for a set of drawers (missing 2 handles, so selling cheap) Great, I thought! Well trying to find matching handles took a while, as there are different handle widths (which I didn’t know). There is a learning curve for sure, but the best thing is to get out there and do it! 🙂 You’re ahead of so many people just because you are starting! 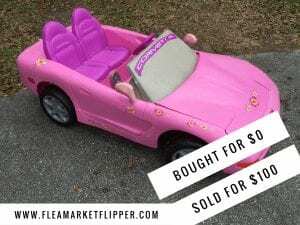 We buy our items from the flea market, yard sales, thrift stores, OfferUp, Let Go, Facebook Marketplace, basically anywhere we can find a good deal! We sell 85% on eBay and about 10% Facebook marketplace. and a few items here and there on Craigslist and OfferUp. Just wanted to say, that was a great read! How do you keep records of your purchases and sales? Just on a spreadsheet? And will the taxmen believe those records are 100% accurate and not undervalued? Thanks so much for stopping by! We use a simple spreadsheet in Excel, and also use GoDaddy Bookkeeping since it pulls in our eBay and PayPal account. We have a CPA that we take our taxes to to help us make sure we get everything noted that we need to. Hi, do you have a link to feedback that other people have left that has taken this course? Hi Robyn, I am so sorry to hear about your brain aneurysm. I hope you are feeling better and recovering well. Flipping used items is definitely something you can do! It takes a little time to find your groove but once you do, you will rock it! I was not a big fan of school, and barely made it out of high school with a diploma, but I have been very successful with this the past 20 years. 🙂 If I can do it, anyone can!! Did you subscribe to our weekly newsletter? We share tips and also our latest find and flips. Wow. That’s a heck of a year. I resell things, but I’m nowhere near your level. 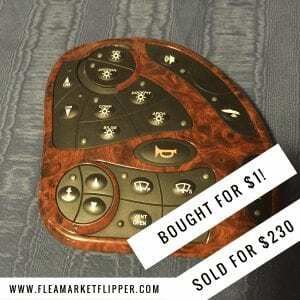 I only do online flipping a couple of hours each week. I need to spend some more time on it. That money could speed up my debt repayment. What a great read! Do you have to pay any sales or state taxes on the items you sell? I am so impressed! I sold a bunch of stuff on Craigslist last April and definitely caught the selling bug. I loved the adrenaline of it! No where near the level that you’re at. Thanks for sharing! haha that is awesome Julie! It does get in your blood and you want to keep the rush going! Plans to sell again soon? That’s awesome, but I’m curious what your net profit was? Do you keep track of how much you bought items for plus any expenses for fixing them up, eBay fees, PayPal fees, shipping, etc? Thanks. Thanks! We do have records of our purchases. 🙂 But my wife keeps our books and she hasn’t finished everything for our taxes yet. EBay takes 10% and Paypal takes 3% of a sale, but not all of our items were sold using these. I don’t lose money on shipping as the buyer pays for that. As far as expenses for fixing stuff up, I don’t usually put a lot into an item (There are a select few that I do). I make sure my ROIs are pretty high for all my investments as well. In many of the blog posts you can check out what I bought an item for and sold it for. 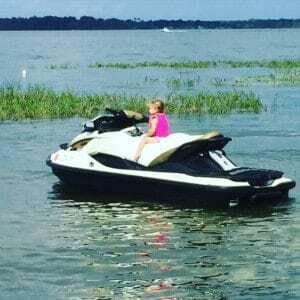 As an example- the two biggest items, the tower we bought for $6K and sold it for $25K, and the jet skis we bought for $5K and sold them for $17K. I am seriously thinking of doing this same thing to make a living and I am so excited about that! I would also love to know if this amount is before or after your expenses? That would determine if I am ready to do this kind of thing or not. Thanks so much for your blogs, I really enjoy reading them. Hi Angie! I am glad you enjoy reading our blogs. This income is before expenses. EBay takes 10% and paypal takes 3%, but not everything was sold using these. Some of them were sold on Offer Up, Craigslist or Facebook so then there was not a service fee. Do you do this part time now?